Picked up a good one today. Heavy sixer (Sears model). And look, Sears branded paddles. 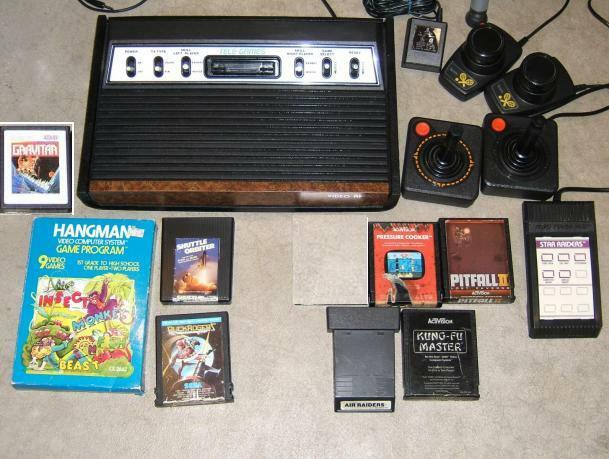 The games on the left -- I didn't have. The games on the right, it turns out I do, so they'll be up for trade very soon. That's between me and Craig. PM me if you really want to know. Chas10e was nice enough to point out the rarity of the silver label Gravitar. Who knew? That is a beauty!!!! Congrats! Shuttle Orbiter is also fairly rare (and a really ingenious game, IMO). That's a fantastic haul! Silver version of Gravitar is one of my favorite label designs, too. That was one of Atari's mail-order only titles. I had a good Craigslist day today too -- will post a photo tomorrow night when I get back to MD. I snagged a few so-so games at Goodwill, but no good finds for me in a while. Never played Pitfall II, I know I can find something for it!! Weird thing about this heavy sixer...it plays on channel 2 only. No switch. No channel 3. Dude. SWEET game, catchiest music on the 2600 in my opinion. Get it! I opened the case...and this one DOES have the switch. And now I'm cleaning all the crud from the inside. First things first: the 5200 VCS Adapter looks way bulkier in that photo than it already is because I stretched the photo perspective to make things easier to see. It's a monstrosity, but it's not THAT big of a monstrosity. So, yesterday. What a collecting day! One of the best ever. The main event was a Craigslist deal. I drove 125 miles in the morning to meet a guy in south NJ to trade two joysticks, two sets of paddles (one being the recently-acquired RickR refurbished set), and a bit of cash for... Mines of Minos (CIB! ), Warplock (CIB), Roc'N Rope (CIB), No Escape (CIB), Adventure, Mountain King, and... CHASE THE CHUCKWAGON! CtCW goes straight into my collection, and the boxed games should help me make back the cash I spent on the trade and for fuel/food on the trip. I asked the guy if he knew of anywhere local that might have Atari stuff. He described a thrift mall a little less than 10 miles up the road, so I made that my next stop. The thrift had a small bin of junk common carts in bad shape, but the store also had an "eBay section" with nicer stuff. The happy news was that everything in the eBay section was discounted 30% from their auction price. That's where I picked up Tapper, another one for my 2600 collection. 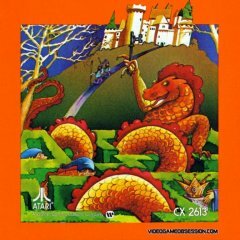 Love the arcade game, and the 2600 port is pretty good, all things considered. I think I prefer Mountain Dew to Budweiser anyway. Next stop was a video game shop I'd once visited a few years ago. I remembered it being a cool place run by a cool and knowledgeable guy. Backing up for a minute -- I've started to listen to older podcasts from Fergojisan's 2600 Game-By-Game series. Well, on my morning 125-mile trip yesterday I happened to listen to one of his episodes from December, entitled "My Video Game Collecting History". Lo and behold, in that episode Ferg mentions the very first store I intend to stop at on the day -- Next Level Video Games, in Blackwood NJ. Fun coincidence. The first games I picked up from the Atari shelves out on the store floor were two 2600 picture label variations on my want-list: Haunted House with no controller info, and Basketball with the box-style font end label (I only found out that this existed a few weeks ago). Great prices, didn't even have to think twice. I got to talking with the shop owner, Nick, and I mentioned the 2600 Game-By-Game podcast I'd just listened to. Ferg, you were well-remembered, and your return to Next Level Video Games at some point in the near future was requested... no, demanded! I very nearly bought a "Too Many Games" limited edition of Ature (CIB), a really cool homebrew adventure game for the 2600. Instead, I spent my money on an untested 5200/VCS Adapter -- I was given a bargain I couldn't refuse on it -- and I got the Pac-Man 1987 label tossed in for free. Nick also gave me a great deal on three INTV games that Rowsdower70 had on his want list: Mind Strike, Mr. Basic Meets Bits & Bytes, and Truckin'. 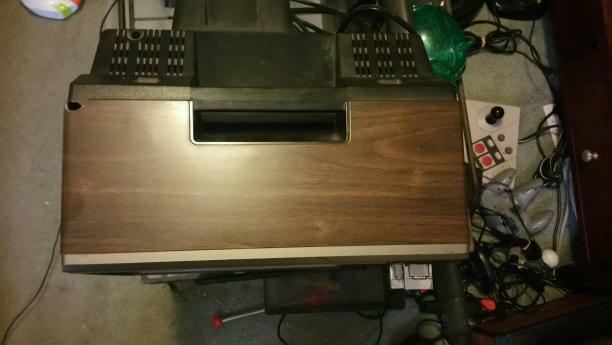 Next stop was another video game shop in the area, but their prices seemed high to me and the owner didn't seem all that interested in making a sale, so I passed up the one pricier thing on my want-list that they had (2600 Gremlins). I'll go to eBay if I want to pay eBay prices! Did snag 7800 Choplifter from their bin of cheap Atari games. Last stop of the day was what has become my favorite game shop in PA -- Classic Game Junkie. Got fantastic deals on Racquetball, Star Strike (yessss! 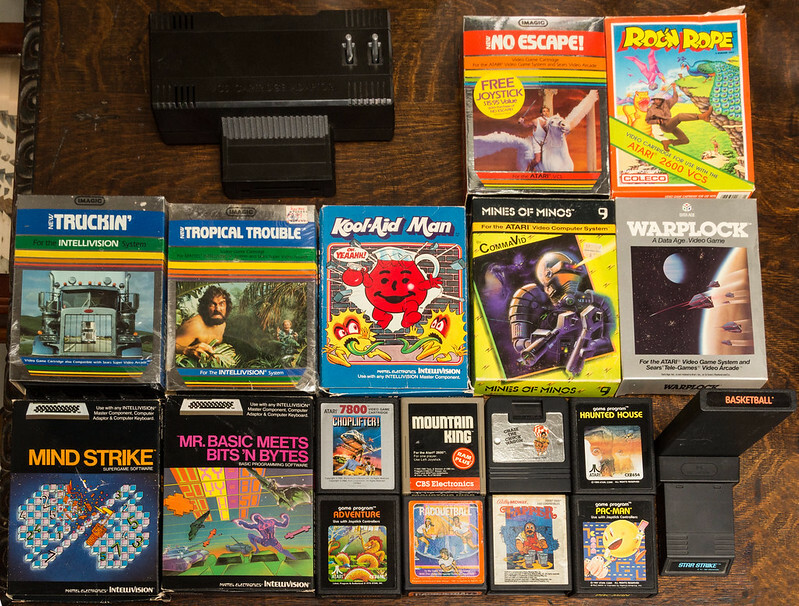 ), and two more INTV games to trade/sell to Rowsdower70: Kool-Aid Man (oh yeah!) and Tropical Trouble. All told, I drove 350 miles on the day and had a great time hunting and dealing. Most days are busts, but this one was pretty darn good start-to-finish. Next stop was a video game shop I'd once visited a few years ago. I remembered it being a cool place run by a cool and knowledgeable guy. Backing up for a minute -- I've started to listen to older podcasts from Fergosijan's 2600 Game-By-Game series. Well, on my morning 125-mile trip yesterday I happened to listen to one of his episodes from December, entitled "My Video Game Collecting History". Lo and behold, in that episode Ferg mentions the very first store I intend to stop at on the day -- Next Level Video Games, in Blackwood NJ. Fun coincidence. The first games I picked up from the Atari shelves out on the store floor were two 2600 picture label variations on my want-list: Haunted House with no controller info, and Basketball with the box-style font end label (I only found out that this existed a few weeks ago). Great prices, didn't even have to think twice. fun maeking road trips liek that and "making a day of it"
What a great bunch of pickups man. Thanks again! Found this on the Craigslist free section. It had been on there for a couple days. I called the guy yesterday and he said i was the first to call him and he was gonna take it to the dump the next day. Im happy i saved it. It works great. 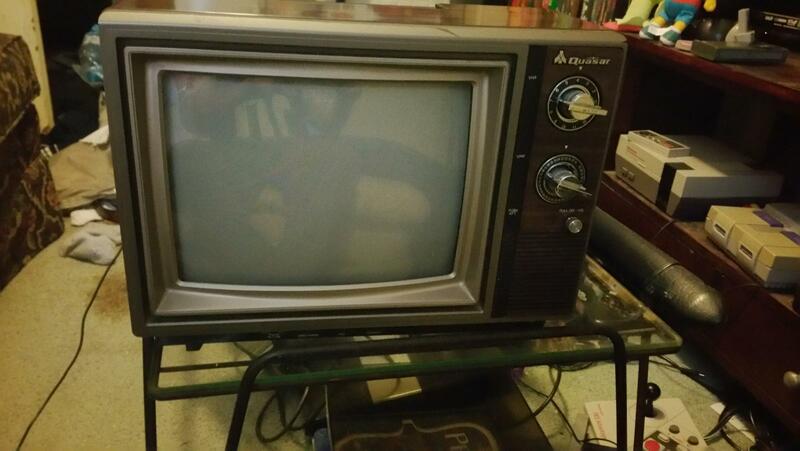 Most important question on that TV: Does it have woodgrain on the sides and top? No matter, that thing is AWESOME. Great find. That thing is beautiful. Nicely done. "The Big Gamble". I got this bundle, which the guy said he found in a barn. Well, it's very dirty, so I believe it. No power adapters. Will any of it work? To tell you the truth, I bought it mostly for the 1030 Modem and the 850 interface. 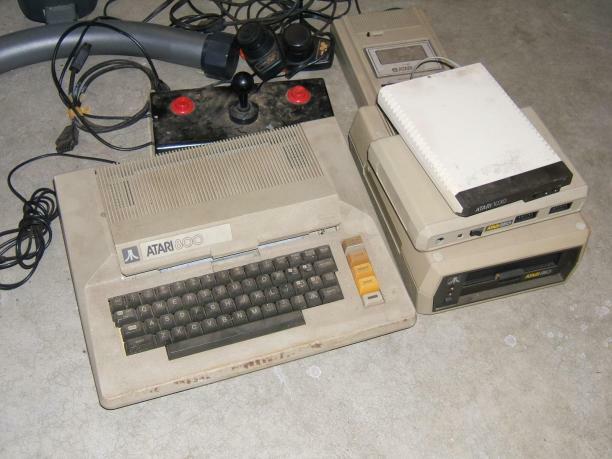 I had a 1030 back in the day, but sold it to help pay for the SX-212 upgrade (300 baud to 2400, I think). Regretted selling it, as the 1030 looks really cool. I never had an 850, and really have no purpose for it. I just think it will look really great next to the other "brown" 400/800 stuff I have collected. I don't really care if these work or not. I just hope they clean up nicely. By the way, if anyone has or comes across power adapters for any of this, please let me know. Forgive me if my posts are boring. Cleanup has started! These things are really really filthy. But the dirt is coming off pretty easy with just a gentle/careful scrub. The joystick is probably the most interesting item. It appears to be a "Gim Electronics Fire Command". It's really heavy with an all metal base. I think it may be pretty rare. No idea on worth or even it it works yet. Sweet find! I'm hoping it will fix up for you! Again, my apologies if this is boring. But I'm SO EXCITED! - The 800 WORKS! It's missing one 16k memory board, so it's only 32k. But it fired right up. Keyboard keys all work. Needs more cleaning though. This thing was filthy. - The 1030 WORKS! This must be an older model...it uses a 2600 adapter. Lights up just fine. Even better, it cleaned up to look like new. - The 850 interface WORKS! Lights up just fine and also cleaned up to look like new. 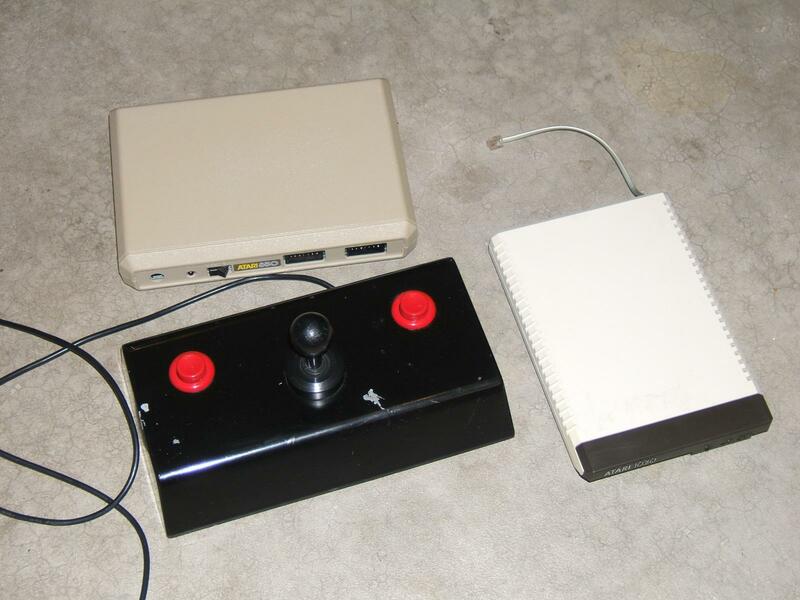 - The joystick works great and is really nice. Feels like an arcade stick. According to an AA member, it's worth about $40. I will most likely sell it but want to play with it a little more before deciding. 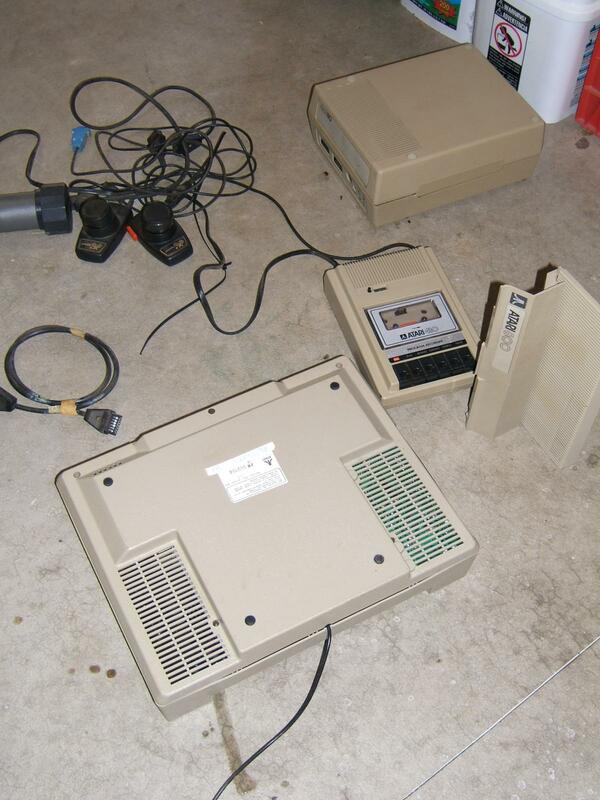 - Have not yet tested the disk drive or tape drive or paddles.